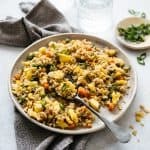 This easy egg fried rice is something that I cook every other week. 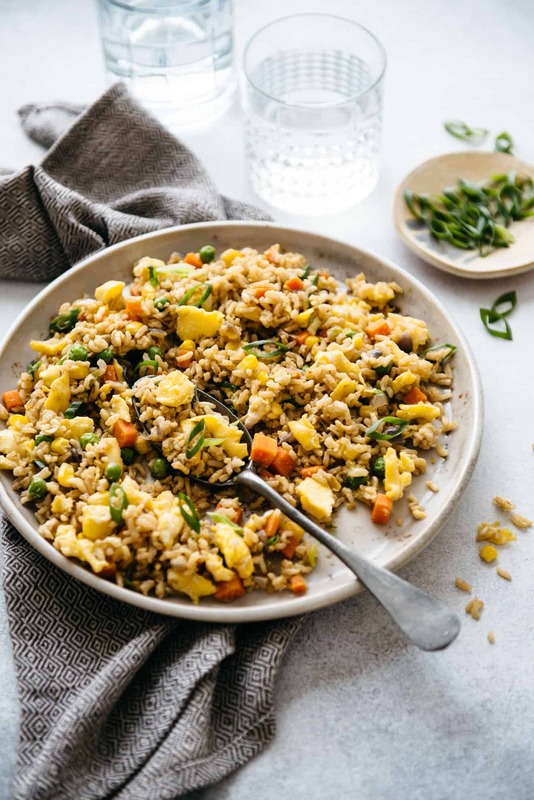 It’s a no-fuss meal, made with seven key ingredients: rice, eggs, olive oil, onions, frozen vegetables, scallions, and soy sauce (option to add sesame oil). The fried rice is great with my Chinese Garlic Cucumber Salad, Sambal Potatoes, Honey Chili Garlic Shrimp. You would be hard-pressed to find a Chinese household that doesn’t enjoy a good bowl of fried rice. 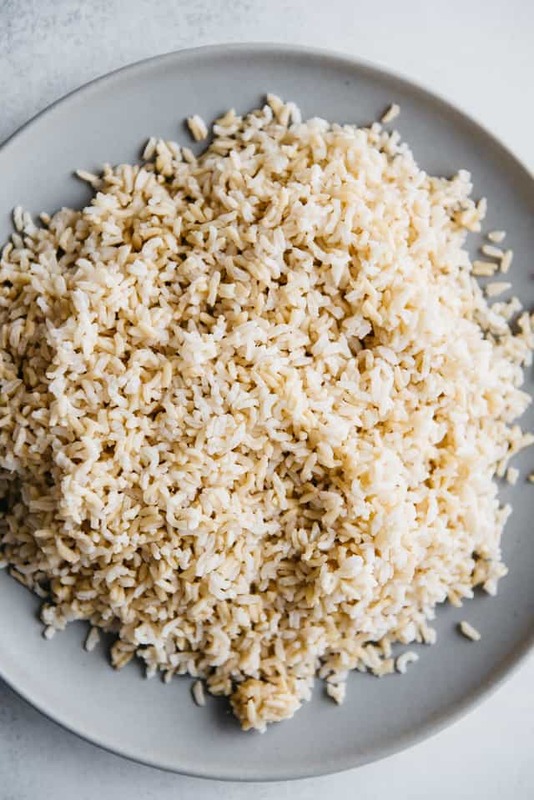 Growing up, whenever I saw a large bowl of cooked rice in the kitchen, I would cross my fingers and wait with eager anticipation to see if it was fried rice night. The flavor of rice mixed with eggs, vegetables and a thin layer of soy sauce was something that brought comfort to my belly. It probably comes as no surprise that I cook fried rice very frequently. Not only do I find this dish comforting, but it is also darn easy to make. All you really need are rice, eggs, vegetables, and soy sauce. 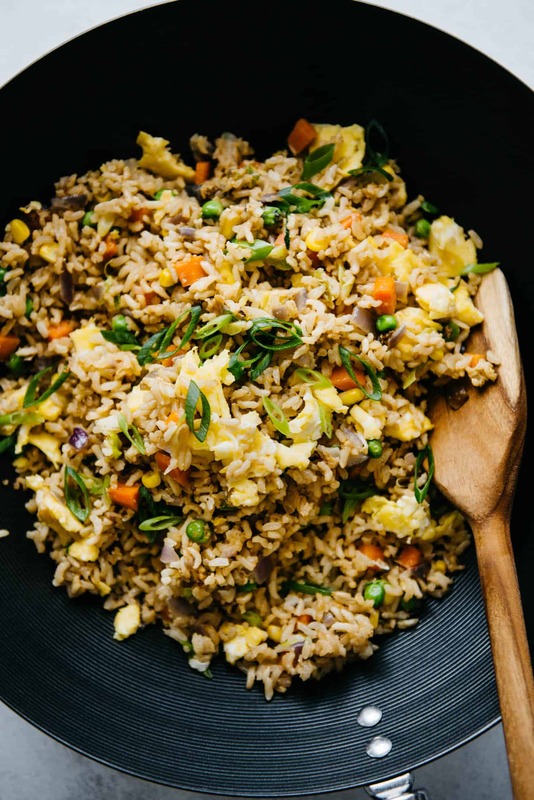 Once you get the into the rhythm of this basic egg fried rice recipe, play around with it! Substitute rice for quinoa, add other vegetables or protein—do whatever suits your taste. Try to use day-old rice: Fried rice is usually a dish that you make to repurpose the leftover cooked rice from the day before. You want to avoid freshly cooked rice because it is still moist and steamy, which may yield fried rice with a mushy texture. (Notice in the photo below how you can see individual grains of rice instead of a mushy mass of rice.) However, if you forget about cooking rice the day before, here is a little trick that I use. I spread a layer freshly cooked rice onto large baking sheets and let the rice air out for about 1 to 2 hours, the longer the better. The grains of rice will dry out during this process. Using packaged rice: For this recipe, I experimented with using packaged pre-cooked rice, which is what you see in the photos. These packages usually contain 2 cups of cooked rice, so you’ll need 2 of them for the recipe. The rice is fine, especially if you are too busy during the week to cook rice. However, it is definitely more expensive than buying rice and cooking it yourself (I sound like a mother here). I also found a slight smell when I opened the packages (probably from whatever preservatives the manufacturer used) but not enough to make me throw the rice straight to the trash. Ultimately, I recommend cooking the rice yourself, but hey, I understand if you don’t have time for that. Looking to cook perfect rice? I have a complete guide on how to cook jasmine rice three ways: stovetop, slow cooker & Instant Pot. LOOKING FOR MORE FRIED RICE RECIPES? Carbon Steel Wok: This is the wok that I use right now, and it is my favorite. Sesame Oil: I typically use this brand of sesame oil. It is toasted, so the oil is very fragrant. I like chunks of egg in my fried rice, which is why I scrambled 3 eggs separately. If you are feeling lazy, scramble all the eggs with the vegetables before you add the rice to the pan. You don’t want to add all 4 eggs after the rice is in the pan because you’ll likely end up with soggy fried rice, and no one likes that. You want to cook the rice at a pretty high temperature. This prevents the fried rice from being mushy. I can get quite a big flame on my stove at a medium-high heat, but some of you may need to turn the heat to high. 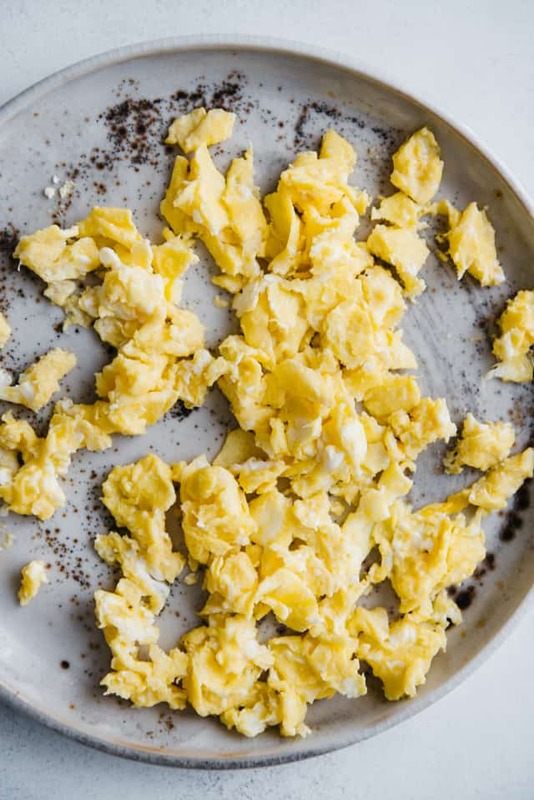 Crack 3 eggs into a small bowl and beat them together. Beat the last egg in a separate bowl. Heat a large sauté pan or a wok with 1/2 tablespoon of the olive oil over medium-high heat. Once the pan is hot, add the 3 beaten eggs and scramble them for about a minute. Transfer the eggs to a dish and turn off the heat. Wipe off the pan or wok with a kitchen towel. Drizzle the remaining 1 1/2 tablespoons of oil in the pan or wok over medium-high heat. Add the onions and cook them for about 2 minutes, stirring constantly. Add the mixed vegetables and scallions and cook for another minute. I like to save some of the scallions (the dark green part) for garnish. Add the cooked rice into the pan or wok and cook for a few minutes, until the rice is heated through. If you have large clumps of rice, break them apart with the back of your spatula. Pour the single beaten egg over the rice and stir to coat the rice with the egg. Cook for another minute. Add the soy sauce and sesame oil (if using) and stir to distribute the sauces. Add the 3 scrambled eggs and stir to mix again. Serve immediately. *You can also use canola oil, vegetable oil, or peanut oil for this recipe. Peanut oil will give the fried rice a nice light fragrance. I know that olive oil is not traditionally used in Chinese cooking, but in this recipe, you can’t really detect the flavor of the olive oil. **I used red onion mainly for color. You can use yellow or white onions instead. ***Use day-old rice if possible. Otherwise, try to let the rice cool completely before stir frying. I love the nutty flavor that toasted sesame oil adds to dishes, which is why I included it in the recipe. Not everyone likes sesame oil. My sister certainly doesn’t. You can still make a tasty fried rice without the sesame oil, so feel free to omit it. If you are looking a basic recipe for cooking jasmine rice, refer to my guide on how to cook jasmine rice three ways. Super Easy! Great tips too! Made this tonight for my family, they loved it, this is definitely the easiest & tastiest egg fried rice, I’ve made, thank you for sharing. Sandy, I’m so glad that you like this recipe! That’s exactly the attitude—anyone can make these dishes! I’ll try this recipe today, thanks a lot ! Just made this! Super easy. The tip about reserving the last beaten egg is the magic touch. No more soggy fried rice. THANK YOU for trying the recipe, Lorraine!!! Thank you for trying this recipe! So glad you enjoyed it. Just made this. It tastes incredible and was so easy to make!! Thank you for this recipe. Thanks for trying the recipe, Lee! Glad you enjoyed it! Just Curious. Is there a reason you dont use sesame oil to cook the whole dish? Hi, Heather! That’s a great question! The flavor of sesame oil is very strong, so a little bit goes a long way. It’s typically used as a finishing oil for dishes for that reason. Would it be possible to use a different kind of pan if a wok is not available? Yes! A large saute pan works too! I am going to try this recipe next week it sounds really tasty,do you think it would be OK to add some cooked and chopped up chicken thigh meat? Yes, absolutely! You can always feel free to modify my recipes. They’re really just there for inspiration. I just tied your recipe and mainly the rice part. I was cooking my rice very last minute and when it was boiled I have made few extra holes in the bag before pouring the water out from the pot. After that I spreaded the rice equally on the baking sheet thinly and left it for just under 30 min.. I didn’t had much extra time. As I was making a portion for 2, I have pre fried 1 egg, then took it out and fried onion (a small add up) added the rice it was nice and quite dry at that point ( I made sure it dried out more on the pan) + 1 fresh egg + quick mix… + pre fried egg. And ready. It was lovely dry . Thank you SO MUCH for making the recipe, Paulina! If time does not permit to use day old rice, keep in mind that yiu can also freeze the rice. Again…line it on a tray in a thin layer, then carefully place pan of tray of rice in freezer. The idea is to protect the “husk” of the rice grain from heat and abuse long enough to heat through but not breakdown. Just be quick once the rice is in. It must not steam too much. Thanks for the tip, Maurice! Hi Lisa, I make several versions of a fried rice dish, but I thought I’d try it with an egg tonight. However I did it before I found your post and I’ve found two things I’ve been doing wrong. Firstly I put the rice on the boil while I stir fry (in a wok) the veg (I use fresh and prepare it as I go through the frying stage just throwing it in stages! ), sometimes adding chicken too. Then when the rice is ready normally by then so I drain it and shake/spin the water off before throwing it in the wok. Then tonight I put one egg in whole at the end and scrambled it in with the veg and rice and I never noticed soggy rice till I found this post!I will certainly give your tips a try in a couple of days. Many thanks. Thank you for this recipe! 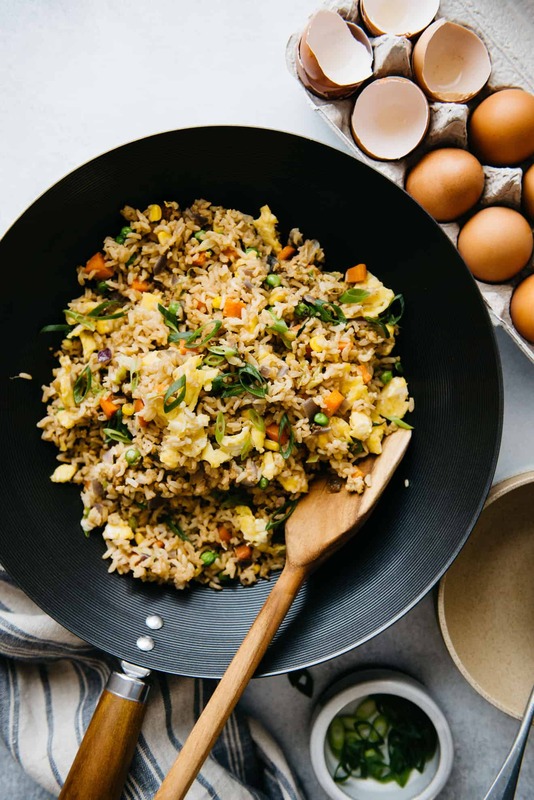 The best egg fried rice we’ve made! Delicious! Yes, either will work fine! Hope you enjoy it! Looks really simple, but not sure about the olive oil, which isn’t used in Chinese cuisine. I think I’ll use a more neutral oil like canola or grapseed, but definitely use sesame oil at the end. Thanks. Please use whatever oil suits your taste! I understand that olive oil isn’t typically used in Chinese cuisine (my mom rarely uses it), but in this recipe, I though olive oil was okay. Again, please use canola oil if you prefer. My husband and I just tried this recipe and it’s super good. Thanks for posting! Thank for trying the recipe, Jessica! Glad you enjoyed it! Yummy, thanks for the idea about cooking some of the egg first and then the rest later. I liked the addition of the sesame oil. Thanks so much! This was fantastic!! Huge hit with my hubby – thanks so much! Thanks for making it, Shena! Hi, Cheryl! If you fire up your wok, throw in the cooked fry rice and let it stir fry for a few minutes (2 or 3) until the rice is heated through. I think it should be okay!